When you spend most of your life hitting away at a couple of keys, you might start developing some expectations: minimal downtime, feel of keys, sound, maybe even extra macros. Then reality hits. I'm not really a stranger to "high-end" keyboards. I've used Logitech's diNovo since ages, and have tested others (I think maybe one of them was a G15?) as a IT journalist. I'm a newborn babe in the world of mechanical keyboards, but let's not jump ahead. First, let's talk about why I decided to replace the diNovo, Logitech's premier desktop keyboard sets. One welcome part - for me - of the diNovo is that it is a TKL, or ten-key-less keyboard. So called because the main part lacks the numpad section: it is actually a wholly separate board. As I have limited desk space, and usually forego the usage of the numpad, this was a welcome extra. One thing you can't say about the diNovo is that it feels cheap when you buy it. It is heavy but thin, and the price tag seems justifiable by the outside build quality. The buttons have a nice feel (actuation force ~60-70g, 2mm travel laptop-style scissor-mechanism) compared to the usual run-of-the-mill desktop keyboard, and are silenced by an extra rubber padding below them (I hate loud keyboard clatter). 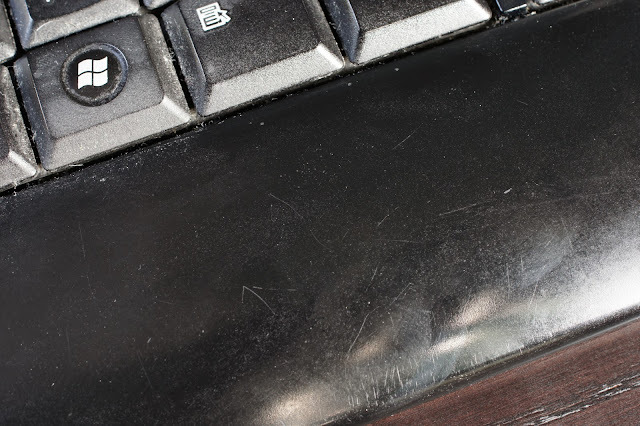 There is even a modestly sized built-in wrist rest covered with very nice rubber. I never liked the mouse given with the set. While it had the right number of buttons, it felt too bulky for my hands, and whenever I grasped it, I could never do so in the correct orientation, making my seemingly perfectly vertical lines slanted, throwing off my aim even in slow generic desktop usage. The flaking also affected the side of the mouse, so after a few weeks of torture, I bought a Logitech G7 mouse, then, years later, a Performance MX. Another "fault" was uncovered after the usual tea spilling incident: the plastic of the cute media buttons on the sides are melted onto the plastic housing, so you cannot remove them for cleaning. In case of sweet tea, this means that unless you are prepared to soak the whole upper housing in water for maybe a whole week, you can say bye-bye to ever using them again. I guess the only good news is that like my very old dual-optical Logitech mouse, you could almost literally wash it in beverages, clean them out, give it a good rinsing and use (most of) the thing afterwards. The main issue was that the diNovo used Bluetooth as the method of connecting to the PC, through a bundled dongle. At first, this appears to be a good thing: you can connect it through other dongles or add-on cards (e.g. : the one in your laptop), although you supposedly lose some Logitech-specific stuff. Let's describe a disconnect with the diNovo: you type away, then notice that a letter you pressed keeps repeating itself ad nauseam. It is as if the receiver got the "key down" event, but not the "key released" one afterwards. Until you unplug it (or wait about 20 secs for it to notice something is amiss), you get an endless stream of that letter or command. I've had enter, page down and volume key stuck like this. The fastest was to reconnect is to disconnect the receiver, unload the batteries (or simply sever their connection) from the keyboard, reconnect, reload, then start hitting a button on the keyboard, waiting for an additional maybe 5-10 seconds. Or wait about 30-40 seconds after the 20 seconds for the software to sort it all out. Or if it was a low battery problem, start searching for full ones. Although in the start the diNovo could reliably detect the charge levels of the batteries, the new low-discharge Sanyo Eneloop made this feature quite unreliable, always showing full. That said, the diNovo keyboard could operate for several months from the 4 AA batteries it required, unlike many budget models that chew through batteries like candy. If only the connection were otherwise stable... But I have to stress that the connection was always a bad one, from day one. I don't think I've ever had more than maybe two weeks without a DC, and several times, I got multiple DCs on the same day, within hours. Note that these weren't in a work environment, but somewhere with right about zilch other Bluetooth signals, a bad mobile reception and only a handful of weak WiFi networks. And when you increased the distance between the receiver and the keyboard (it generally sat on its USB extender about 30 centimeters away), say put the PC under the desk, so the metal PC case is somewhat blocking the line-of-sight, the connection became noticeably worse. And then there were some cases where unless I did a full secure reconnect - which takes minutes o work itself out, while the software steals focus every fraction of seconds so you can't even do anything else - the thing just wouldn't work. One disconnect every couple months would have been OK - after all, it is a wireless keyboard with no way of charging the batteries. But when you have to screw around the HW during work and get killed in-game, some times multiple times the same day, it can get very frustrating fast. Seemingly there were multiple avenues open for me. My main requirements were a ENG-UK-like layout, a quality build and that since I worked during the nights, I desperately wanted an illuminated one. A screwed up ins/del/home/end/etc key island is a big no-no for me, as is size and if the manufacturer made sure that popular gaming keys cannot be pressed together. (Logitech is reportedly guilty doing this on many "non-gaming" slim profile keyboards to artificially increase sales of the generally more expensive gaming sets.) 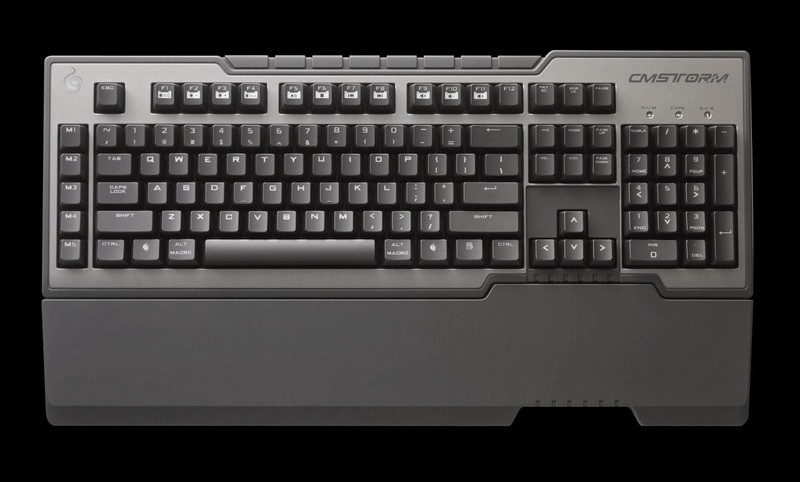 Secondary stuff was possibly getting a TKL variant, with low profile keys, having a generous weight and price. Although I liked the idea of a small display, I didn't want to pay through the nose for the exclusivity, and ultimately, novelty it offered. Plus, as I use Synergy for a multi-PC, multi-monitor setup, the games wouldn't be able to use it for information display unless I reconnected it every time. At first I thought I could have gotten some other Logitech keyboard. After all, the unifying receiver I used my Performance MX showed none of the disconnect problems. But then I had to realize that my ideas about the perfect keyboard were unachievable unless I somehow manufactured my own, for which I don't have either the capital or the mindset to start a Kickstarter for. But one thing was certain: even the primary reqs disqualified every Logitech keyboard on the market. This was when I came upon mechanical keyboards, N-key rollover, Cherry MX switches, o-ring mods and the like. (Well, OK, I knew about them for decades, but never really considered them.) They did seem to fulfill most of my reqs: you could buy them in ENG-UK layout, (and you can change the keycaps if you'd like, as I would) some were illuminated, the key island was not botched, some of them were TKL and most had some sort of real key rollover function. There were - of course - issues. First, the sound: mechanical keyboards are notorious for having quite a loud feedback, even on the "silent" ones with black, brown and red switches. Some love this, I certainly don't. I did not even consider one with blue, green or clear switches that have an extra loud click around the activation point. Luckily, there is the o-ring mod, which inserts a silicone ring between the keycaps and the switch domes, to reduce or eliminate the harsh bottoming out sound that is the most problematic. It also shortens the maximum key travel distance, which I find an especially great idea, as frankly, moving any more past the 2mm activation barrier is a waste of time and effort. Having low profile keys is very exotic for mechanical keyboards, almost nonexistent. Most of these are either very large - thus disqualified - gaming keyboards or compact - with mashed-up key island, thus disqualified - ones for travel. So I reluctantly gave up upon having a notebook-slim keyboard. Size, price and illumination are all interconnected issues. First, illuminated models are at a premium, second, TKL variants are a bit rare, illuminated TKLs are much more rare, and illuminated TKLs with a good price point (I desperately wanted to remain below my self-imposed ~$100 budget) are maybe nonexistent. So one or more of them has to give. 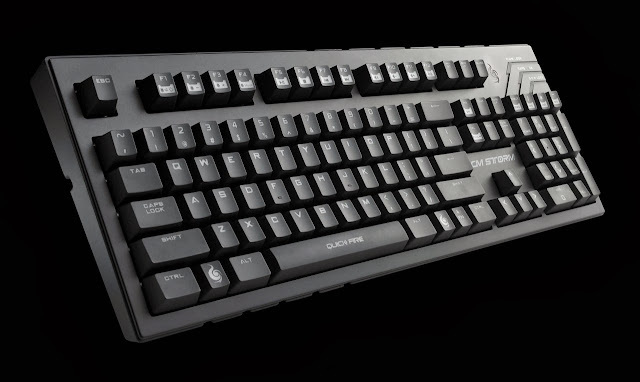 Then came kotaku's "best gaming keyboard" challenge, where the forum members would nominate their favorite ones and vote on them. This introduced me to the budget-priced (at least in the brand mechanical keyboard market) CMStorm QuickFire Rapid and the QuickFire family in general. While I cringed a bit at the gamer design, it wasn't that bad. The Rapid had one problem: no illumination. Still, very attractive price point, and it was a TKL variant. The TK had illumination, but eschewed the cursor+key island and got a numpad instead, instantly disqualifying it. The Pro had a partial illumination (which would be enough for locating the keys accurately from the corner of the eye, which is what I really wanted it for), but had a higher price point (~$120) and was a full keyboard. Luckily, the size was still manageable, as it would fit in the space the diNovo occupied before, if barely. The Trigger had some very nice macro buttons, illumination but it was a bit too big and expensive, disqualifying it. While the macros and the HW-level re-programmability would have been nice, I do use AutoHotKey for my macro needs, which it fulfills mostly. At the same time I started searching jokingly for mechanical keyboards on eBay, smiling at the Chinese fakes after seeing some reviews about them, and I stumbled upon a seller who sold "manufacturer refurbished" CM Storm keyboards, with multiple layouts, for quite a bit less than their street price here. Most likely they were returned goods the buyers didn't like the feel of, but I can't be certain. Now, I generally don't like refurbished stuff, but as I just couldn't get a UK-ENG layout where I live, (note that I really hate the INT-US layout) and their prices were noticeably lower (with the Pro being only about $4 more expensive than the Rapid), I went ahead and ordered a Pro with red switches, which arrived safe and sound, with barely a scoff mark from the previous owner, working perfectly. The illumination is partial, lighting the WASD gaming area, the space key, the FN and lock keys and the cursors. I also ordered a silencing silicone o-ring mod set from some Chinese outfit and the softest, most sound-dampening set from WASD-keyboards, both of which have yet to arrive. Most likely I will apply both as fast as I get my hands on them, as I do dislike the horribly loud bottoming out sound it has. I tried sourcing it locally, but as funny as it sounds, they seem to be quite scarce. I'll do a proper review later, after the modding and the settling in, but for now, I have a few words about the keyboard: yes, it feels great, and the illumination did help in quickly locating it in the semi-dark nights. It does have a few issues, coming from the diNovo: first, the keycaps are a bit narrow, their edges are maybe a bit too pronounced. The FN key placement and execution is bad, for two reasons: first, I am one of the few people who actually used the context menu button. I miss it, and Logitech's placement of it right between the ESC and the F1 was so much better. It has a very bright neon-red plate to go with the re LEDs. Second, you actually have to disengage it every single time. Usually, on notebooks, you can chose to do a combo press of FN+desired key, and this deactivates the FN function afterwards. CM chose to go with the "you must deactivate manually after each use" mantra. As I use the volume controls (FN+F9-11) and Ctrl/Alt-F# keyboard shortcuts quite often, the constant need for manual deactivating has quickly become a chore. Not unmanageable, but still a bother, especially since I saw it being done much better. I would have been quite happy with separate multimedia keys. And since I've been contemplating buying a USB sound card with a separate volume knob, I might just bite the bullet and get one. Yes, there will be a full review of the QuickFire Pro later, most likely months later. I might try other mods on it, or changing the keycaps. I'm already looking at WASD keyboard's custom service, but I am still undecided about it, as it costs quite much, even if it means I would finally have a keyboard layout to my own specifications. Till then, bye!